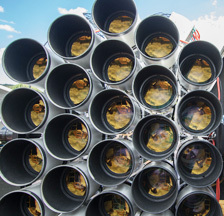 Dragonfly telescope in Cloudcroft, NM, thinks for itself while it hunts for dark matter galaxies. Image by Pieter van Dokkum, Ph.D., Astronomer, Yale University. September 30, 2016 New Haven, Connecticut - One of the most anticipated astronomy breakthroughs since the Hubble and Spitzer Space Telescopes is expected to come from the James Webb Space Telescope now scheduled for launch in October 2018. The JWST will have the Earth's best resolution and sensitivity ranging from long-wavelength visible light (orange-red), through near-infrared to the mid-infrared. It's theme is to “see first light,” meaning as far back in time to the beginning of this universe as possible.